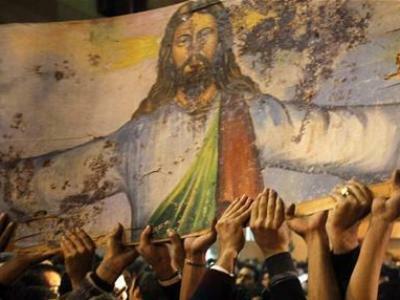 Hundreds of Coptic Christians on Thursday attended the burial of a father and his son who were killed by a police officer in Egypt’s Minya province, amid cries for the state to provide more protection. While Wednesday’s killing appeared to be the result of a dispute between a construction worker and his son on one side and a police guard on the other, it angered local Copts still reeling from the death of seven members of their community in an Islamist militant gun attack in November. They said the policeman was in custody being questioned while authorities reviewed CCTV footage from the church’s security cameras. “One, two, where are the rights of the martyrs?” the crowd chanted. “We call for all armed police officers assigned to guard churches to be checked. Are they qualified to carry live ammunition, so that they don’t become a source of danger rather than protection,” Macarius tweeted.